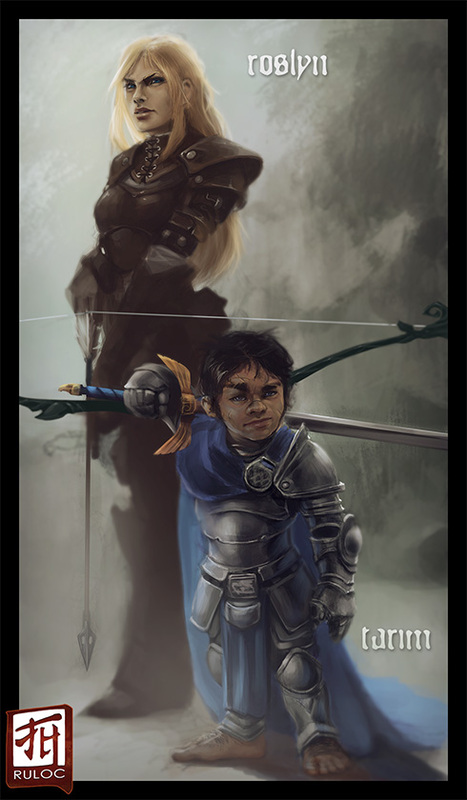 -Tarim is a male halfling fighter standing only a few feet tall. He wears well taken care of custom fitted full plate minus the helmet and a blue cloak. He would likely have the Andoran symbol (a gold eagle clutching a sword) as a cloak or belt clasp or both. He wields a great sword with eagle motif crossbar above the hilt and carries a few javelins on his back. He has slightly unruly black hair, blue eyes and an easy smile with a few small scars on his face and hands. Also he would be barefoot with the common hairy Halfling feet. Tarim recently became a knight and I would like if possible to have a noble presence to him along with a sarcastic bearing. If possible I would like to be posing with my wife’s character Rosalyn and possibly in the background her animal companion Midknight. If this is to big of a change I understand. Roslyn is a blond haired beautiful human ranger; she has big bright blue eyes and a slightly upturned nose. Her hair is slightly unruly and down to the middle of her back. Roslyn is always on guard and swift to strike. She is 5 foot 7 inches and 135 lbs. She uses a dark green long bow, which is intricately designed with leaves in an elven/forest motif and employs a variety of arrows, mostly bane of anything. She has a dark blue cloak and wears brown leather armor that is covered with pockets and buckles. She has a short sword that is just for emergencies, and hardly ever used, so it looks like new. Roslyn has a wolf named MidKinght. He is a wild wolf that is as large as a horse. He is dark and has bright blue eyes and large white teeth.